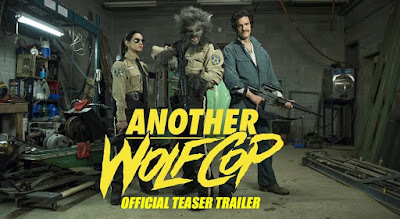 Director Lowell Dean was the man responsible for the original Saskatchewan-based Wolf Cop, about a hard-drinking local cop who transforms into a donut-eating lycanthrope when the moon goes full. Now everyone's favorite alcoholic werewolf must spring into action when an eccentric businessman with evil intentions seduces Woodhaven’s residents with a new brewery and hockey team in this outrageous horror-comedy sequel. Written and directed by Lowell Dean (WolfCop), produced by Bernie Hernando, Deborah Marks, and Hugh Patterson and distributed worldwide by Cineplex, Another WolfCop stars Leo Fafard, Amy Matysio, Jonathan Cherry, Yannick Bisson, Serena Miller and Kevin Smith. Another Wolf hits theaters December 1, 2017.